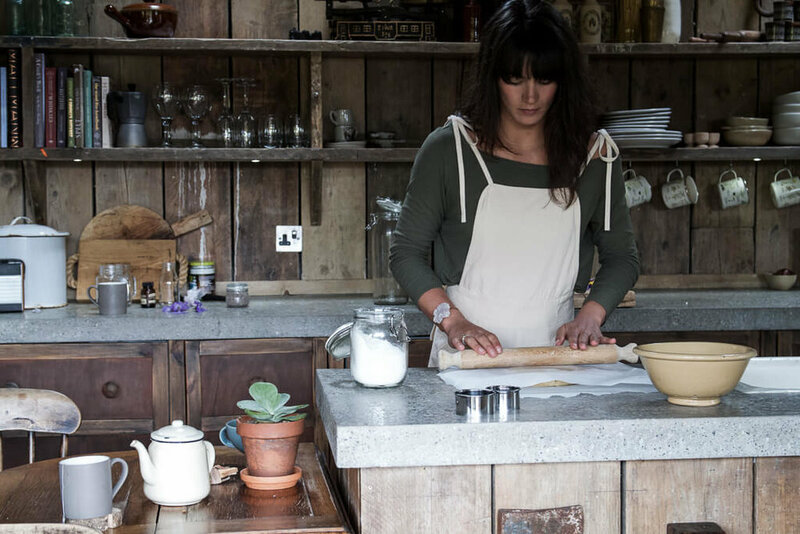 For this recipe we were lucky enough to be baking in "Firefly" a traditional, woodcutters hut, transformed into a luxury haven, hidden away in the heart of the Cornish countryside. The beautifully rustic interiors are built with natural materials, curious trinkets and an overwhelming sense of style and luxury. As we drove through the meandering back-roads and approached the property immersed in rural charm it felt like we were on the set of a Modern day western! 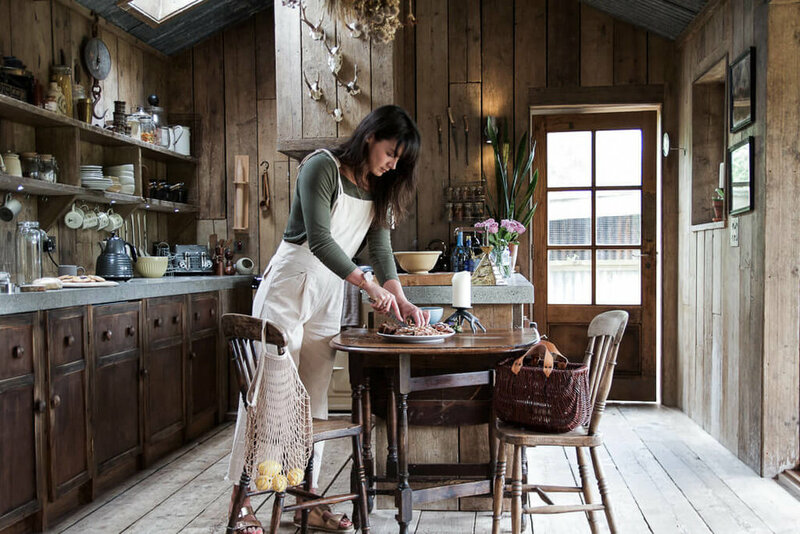 For this shoot we selected some key props from the beautifully eclectic MMW, a boutique fashion and homeware store in Newquay. Not only are these little biscuits free from dairy and gluten, they are free from refined sugar too! They’re really simple to make, and I definitely recommend making a double batch then you can freeze some dough or even better some pre cut unbaked biscuits so you have them on reserve! Having said that, if they last long enough I’d happily keep them at home in an air tight jam jar for a week or two no problem. So these shortbread are surprisingly easy to make, unlike many of my recipes this was a first time trial to make a vegan biscuit that was gluten free too. Luckily I measured everything before hand as so many times I’ve cracked a recipe and forgotten to make note of how much I’ve used! Begin by beating the coconut oil the same way you would cream butter for a biscuit recipe. I do this in my kitchen aid with the paddle attachment but you can easily do the same in a bowl with a wooden spoon, just ensure your coconut oil is nice and soft to start with. Then stir in the maple syrup and vanilla bean paste until it’s combined. Finally as the flour, ground almond and sea salt and gently fold it all together or use the slow speed on your mixer. The sea salt is essential as it adds depth the same way salted butter would and along side the vanilla it gives a proper cookie dough flavour. Once the mixture has all come together a resembles biscuit dough, I recommend rolling it into a sausage shape then place in a airtight tub or cling wrap and put it into the fridge for a hour or two to firm up. When the dough is nicely chilled roll it out between two sheets of baking paper. This allows you to achieve a nice thin biscuit with a smooth even finish without having to add more flour to stop them sticking. I recommend working with half the dough at a time whilst leaving the rest in the fridge as it’s easier to manage a smaller amount and it rolls out better when cool. Once rolled to around 1/2 cm thick you can cut your desired shapes using a cookie cutter or free hand with a knife into classic shortbread rectangles or whatever shape you like. Now for the fun part! Decorate your biscuits with whatever edible flowers and petals you have. If you can’t get hold of any flowers you can always use herbs like lavender or rosemary which often flower or i highly recommend trying to grow your own. I’m terrible at keeping even the hardiest of plants alive but my violas outside my kitchen window are thriving and produce around 20 flowers every couple of days from one small plant. To ensure the flowers stick I flatten them slightly before placing on the biscuits then gently squash them onto the surface. You can also dampen your fingertips win cold water to help them stay put. Bake in a preheated oven at a low heat of around 150, this helps to retain the colour in your flowers and avoid them scorching. Keep an eye but they don’t take too long all, as soon as they have the slightest colour at the edges take them out, this usually takes around 10-12 minutes. They may seem uncooked but once cooled they firm up. Special thanks to Francesca at Unique Home Stays and Michelle at MMW.